I am an art teacher. I often look to the internet for ideas for art lessons. I have decided to start a series of art lessons on Eco Child’s Play to inspire homeschool parents and teachers. It is best to buy eco-friendly art supplies, but we don’t always have access to them. The lessons I provide will not necessarily be eco-friendly per se, but there is always a way to tie them into the environment, nature, conservation, etc. 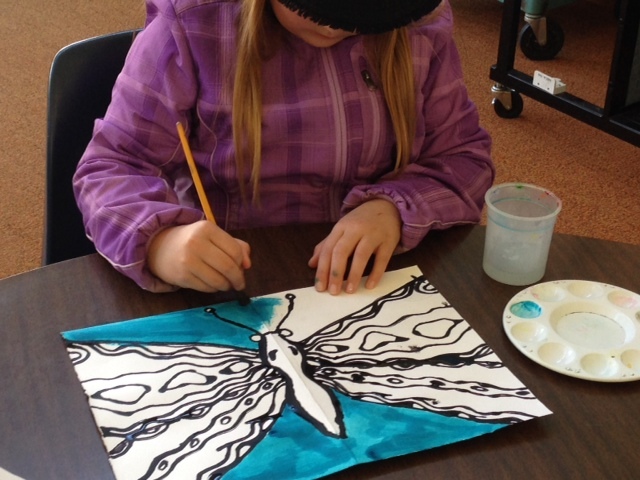 This month my class has created butterflies with liquid watercolors and black glue. Our focus has been symmetry in nature. Discuss symmetry. Ask children to brainstorm examples in nature of symmetry (our own bodies being the prime example). Symmetry has been tied to our perception of beauty in the human face. 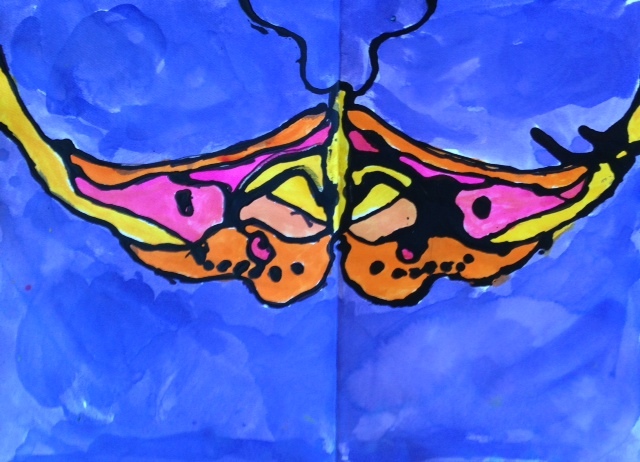 Look at images or scientific drawings of butterflies focusing on symmetry. Have children complete a sketch in their sketchbooks or on paper if they don’t keep sketchbooks. Fold watercolor in half. Children draw half a butterfly. Go over the pencil lines with Sharpie. 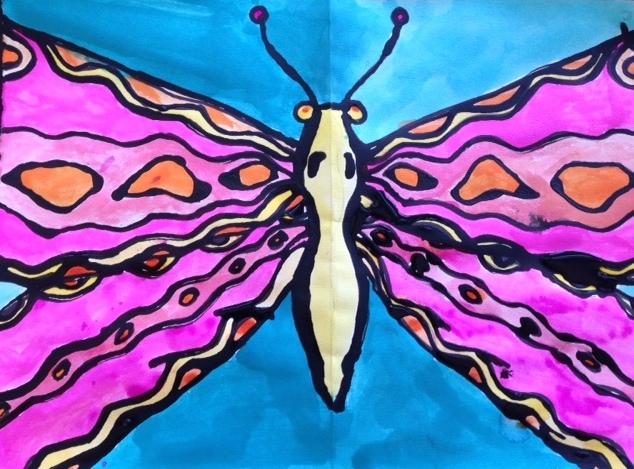 Flip the watercolor paper over so that children can trace the other side of the butterfly insuring symmetry. It may be helpful to tape the paper to a window for the children to see through. Make sure you tracing onto the correct side to make a complete butterfly. Now go over each line of the completed butterfly with the black glue. I make this ahead of time by pouring the white glue out of the squeeze containers, mix it with black tempera paint, then with a funnel put the black glue back into the squeeze bottles. Children may want to practice on a separate sheet of paper. It doesn’t take much of a squeeze to get the glue flowing. If the children drew too much detail, the glue will blob in those spots. Some symmetry will also be lost as the glue flows, but this inspires a good discussion. (This step may be skipped. The black sharpie lines will provide enough contrast). Allow the glue to completely dry before moving on. Provide children with sheets of different colored paper and ask them to sort them. Ask the children to explain why they sorted the paper the way they did. This should be done in groups. Some groups may sort by warm and cool colors. If not, sort colored paper for them and ask them why they think you sorted the paper as such. Discuss warm and cool colors referencing the emotions they evoke and color wheel. Give children liquid watercolors in only warm colors. I prefer the liquid watercolor for its vibrancy. 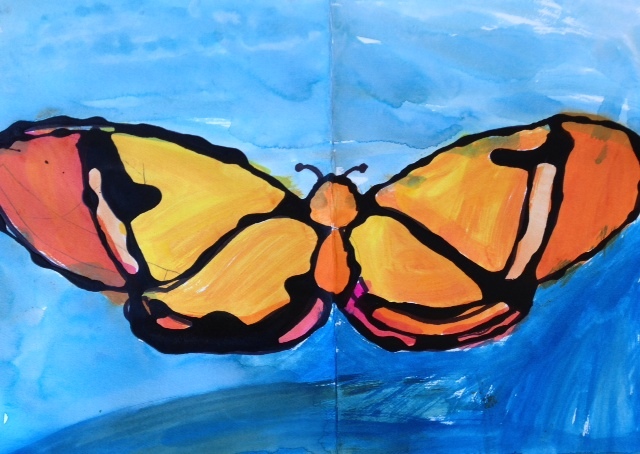 Children paint the inside of their butterflies with warm colors only. Review symmetry before painting! Have children select one cool color for the background. These projects turned out really well! I was impressed with how the multigrades I teach were able to grasp the concepts and create beautiful pieces!